The capital of Extremadura, Merida was one of the most famous Roman capitals of the Iberian Peninsula and features some of the best preserved Roman ruins in Europe. Extremadura was held to be the traditional boundary between Moorish and Christian Spain. Merida itself was passed between Christian, Moorish, and even Portuguese control. It's a fabulous place to walk. Like Rome (only much smaller!) archaeology pops up in the strangest corners, and the Moorish influence adds a grace of its own to the town. Bus: The station is on Avenida de la Libertad near the train station. There are fewer buses to Madrid, but connections to Seville (6-8 buses per day) are much better. Car: The N-V superhighway passes through Merida from Madrid or Lisbon. As in other cities in Spain, lunch and dinner are served very late. Restaurants don't even think of serving dinner before 9 pm or so. Your best bet, unless you're on the Spanish schedule already, is to go to a tapas bar; most open around noon or so. Tapas are small plates like appetizers you can eat standing at a bar. Meant to satisfy one's hunger between meals, you can make an interesting night of going from bar to bar, eating tapas and drinking beer or wine. Some tapas are free, you may get a small item with your first drink order. The more tasty and ornate tapas will cost you but are quite moderately priced. The tapas experience, especially off the beaten track in towns like Merida, can be a rewarding one--you'll meet friendly people who just come round to chat after (or before) work. Merida is not an expensive place to stay. The highly rated Hostal Acueducto Los Milagros has a friendly staff, a bar, free parking, and is air conditioned--despite its low room rates. Even the historic Parador de Mérida is a great value. It has a bar, sauna, restaurant, and work-out room. If you prefer a larger house or other vacation rental, see HomeAway's Merida Vacation Rentals. The Roman Theater (Teatro Romano) is the jewel of Merida's Roman heritage. It was built by Agrippa in 18 B.C. 6000 people could be seated in the theater. In June and July, plays are staged there. There is over 5 miles of aqueduct running though Merida, although there isn't a section as complete as the one at Segovia. The Acueducto de los Milagroson the northwest side of town is the most complete and feeds two nearby man-made lakes. 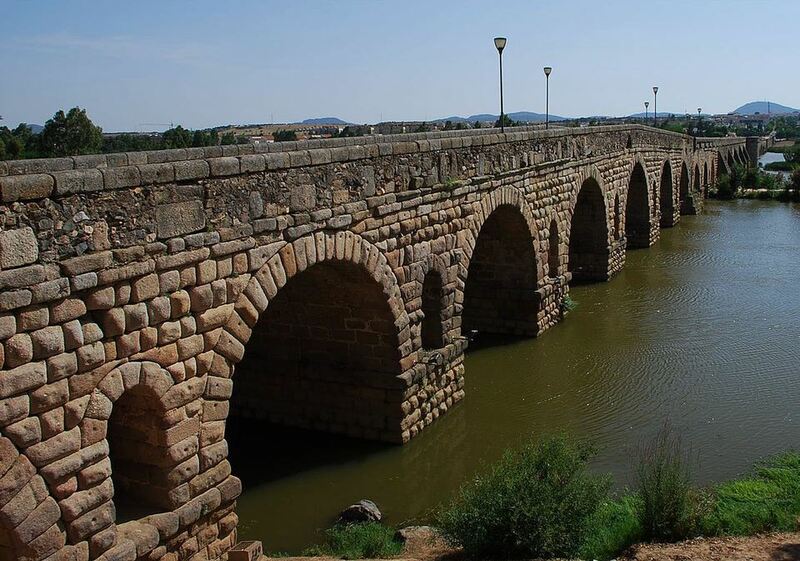 Consisting of 64 Granite arches, the longest in Roman Spain, it's now a footbridge over the Guadiana river. The bridge is shown in the picture above. The modern bridge you see behind was used to take the load off the ancient one; it wasn't until 1993 that the Roman bridge was decommissioned as the main entrance into town for vehicle traffic. Right smack in the center of town is a strange looking Roman ruin consisting of several columns. In the 17th century, a nobleman built a rather large residence inside the columns, using four of them in the construction of the house itself. What a fence, these columns! The Alcazaba, constructed in 835 from the remains of a Roman fort, is located near the Roman Bridge, which it was designed to protect. There are good views from the top. The Museum, opened in 1986, provides a beautiful display of statuary and other antiquities used by the Romans. It's located in front of the entrance to the theater and amphitheater. If you are coming from Spain and headed into Portugal, I recommend driving to Belmonte, just across the border, checking in to Pousada Convento De Belmonte (and you must eat at the restaurant! ), then if you can stand being out of the luxury of the converted convent with the Roman ruins and magnificent local cuisine, head up the hills for the Serra da Estrela and Penhas Douradas. You'll be charmed, believe me.